Sheerline 950 aft cockpit, "Khaleesi"
This very tidy Sheerline 950 aft cockpit offers easy stern access together with aft cabin. With sreens folded the craft takes advantage of a low airdraught, This is a high specification cruiser. Sheerline 950 aft cockpit, "Sheer Impulse"
This very tidy Sheerline 950 has been updated and modernised to high standards by her current owner. The galley and toilets have been refinished and a built in generator fitted. The aft cockpit Sheerline range is a classic Andrew Wolstenholme designed cruiser which has a generous keel line to provide easy handling at low speed on the river. The folding hoop and screen set allows this larger boat to navigate bridges as low as 7ft. 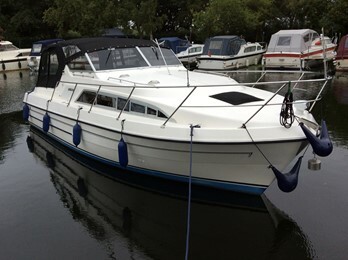 The boat is available in 2 versions, standard and tri cab. The tri cab version has a double berth extending under the cockpit.The boats are famed for a quality fit out in choice timbers. Most craft will come with heating,hot water, showers and fridges. 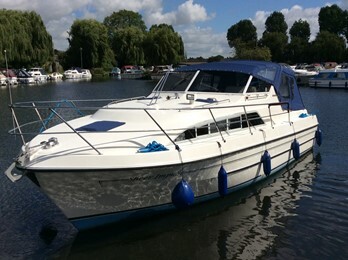 The latest version is known as a 955 and has a modified cockpit to include a walk through transom door.